Last night a friend of mine rang and I let it go to voicemail since we were sitting down for dinner. Once I listened to her voicemail she had listed out her schedule for the week and how “busy” she would be and how “busy” life is and so on. If I could try to find time to call her in between her millions of things, that would be great. I have been the one trying to get ahold of her for a couple of weeks now. It wasn’t just for any reason, it was to tell her I was pregnant so she didn’t have to learn the news from Facebook. But time was running out. I shot her a picture that we are planning on posting to FB and she immediately called me. I guess she wasn’t so busy after all. I’m not trying to pick on my friend but I am using her as an example. 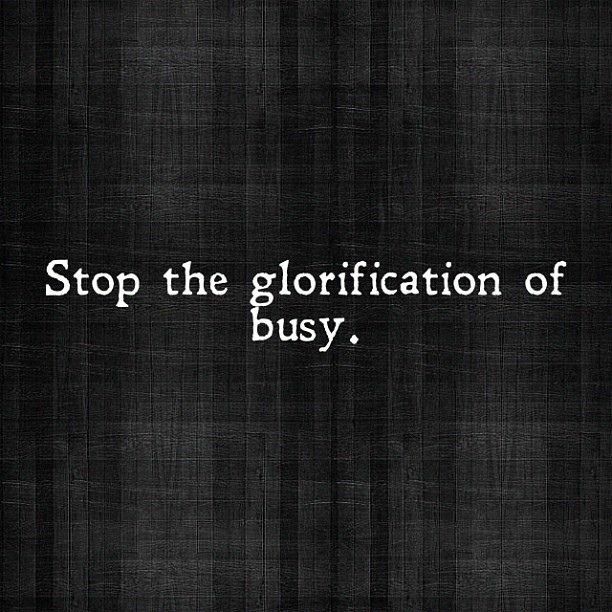 The Husband and I have been purposely trying to ban the “busy” excuse from our daily lives. In this day where we have every means of communication available to us at our finger tips, we sure do think of a lot of excuses to not be able to call Grandma or a friend we haven’t spoken with in a couple of months. I’m tired of getting the excuse from friends and I sure don’t want to give it back to them. Unfortunately, as much as we live in a “busy” society, we also live in a society that doesn’t seem to know how to say “no” from time to time. My Husband started saying “no” to side jobs. They are great money but woah are they time-consuming and cause some serious stress. It was adding to the busy excuse as well. The second he started saying “no” he felt much better. After he said it a few times it got easier and freed up time to do what he wanted to do. Sure, some of the things that make us busy we can’t say no to. Sometimes are lives really and truly are busy. But the rest of it….really? Why do we even feel the need to make the excuse? Isn’t it a good thing to be busy, to have friends want to call and meet up, to have weekends filled with family activities, stay-cations, mini trips, long trips, or even lazy days filled with movie marathons? That means you are alive, not busy. That means you are doing something with your life. You are finding purpose. Why not enjoy it instead of rushing through it? By losing the “busy” excuse in our summer (and saying no!) I cannot express how much more we seemed to live in the moment. I can honestly tell you we took every minute we possibly could out of our summer and made every effort to make time stand still and summer last a bit longer. We really aren’t busy right now, we are just indulging daily in life. love this! it is really hard to say NO, especially for me when it involves making money and I’ve realized that sometimes I just need to say NO for my own sanity. I’ve turned down some extra opportunities bc I can’t keep up with everything, and it was great! It can honestly be life changing. Money isn’t everything. Our time together is much more important and man it feels good! I nice read for a public holiday.